Mermaid Lagoon Theater reopens today with a new show, "King Triton's Concert." Triton could have been a human actor also and the puppets could have been aa. Oh well... I don't like it. Interesting how Ariel's sisters are a part of the show. I'll have to catch a video of the full performance. I remembered the older version had so much performances. I love the puppets, the projections not so much. I'm sure it'll be a delight to see, but it seems like it got the Sindbad treatment: lessen the conflict, take all the scary stuff out. After 15 years the show desperately needed a total refresh, and it got one. More than you can say for the Lion King show running in Animal Kingdom. Going to see it in less than two weeks. Does anyone know if there's a lottery system for this show? If this uses the same format as the old show, then there should be performances almost back to back. You just walk up and queue for the next showing. The show does offer Fastpass distribution, which will probably be useful to deal with the increased crowds for the first few months of its opening. Will reserve judgement until I see it first hand in a few weeks. From what I hear it is being well received. We were at TDS last Wednesday and I ducked in, hoping there may be a soft opening. The attendant CM told me through staggered English, "Twenty four hours", meaning tomorrow. Strangely there were actually people standing at the barricade but, in hindsight I put this down to the Japanese/Asian predilection for "One person stands still for long enough and then people just line up behind them"
Trust me, once we identified this phenomena we tried it out at multiple locales, in different parts of the country and it never failed to work! The Lion King show at Animal Kingdom is still popular, and they even just built a new theater for it, but it still could use a refresh. 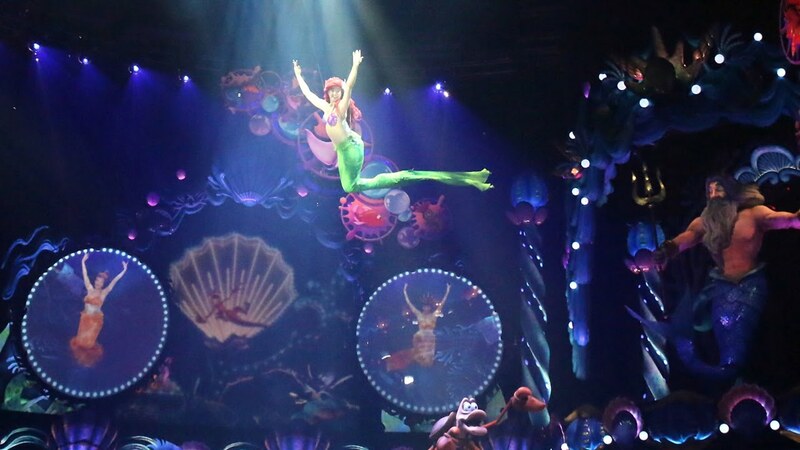 The Little Mermaid show at the studios is so awful that it has been pushed far from my mind. Fortunately my daughter is now a teen and we are no longer forced to sit through it. Watched the show on opening day, it felt a bit short to me. Also the lack of performers tell me this is a more cost effective show. Not the Sisters screens but the other screens are just horrible, so blurry I thought I needed to be wearing 3D glasses. It wasn't a region-based predilection. I was there last Wednesday, too. One of my friends fortunately got us tickets for the preview opening which was held that day. The people you saw waiting were not just lining up to see what happened. We had tickets. TLM, and I guess I sort of saw Harold and Sebastian as his "crew," while Flounder and Sebastian are Ariel's. I imagine Harold as being a lot like Jonathan from 30 ROCK, another of my favorite minor characters. Anyway, it's good to see him. Maybe he'll sneak into some merchandise, too! I want a strap or keychain! Sad to hear that. Mystic Rhythms will be also changed to screens as well... To much screening/projection at the moment. But I dont mind if the show is enjoyable. TBH the old show wasnt that great and most of my friends slept during the performance.